Glen Esk Road â€“ Glen Esk is one of the Angus Glens in Scotland and is still a very remote area, famous for hunting and shooting. Dr William Stockwell, original Pakeha owner of Piha, gave the name to the area as it reminded him of that part of his Scottish homeland. It was also the name given to the Kitekite Falls until the Maori name was restored in the 1990s. Kitekite – properly Ketekete, the name relates to a revenge attack by Te Kawerau a Maki on visitors from South Kaipara. Ketekete was the clicking sound that Te Kawerau made to communicate in the lead-up to the attack. Nga Wai Whakatu a Kupe – the rough sea of Kupe, the sea off the coast. Kupe came down from the Pacific and was being pursued along the Coast. He made the sea rough so people couldn’t catch him. 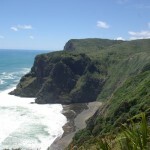 Te Pona Whetu – little hill at back of North Piha. Maki’s son, Ngawhetu, Â hurt his hand in a fight at North Piha and his knuckle stuck up. Wekatahi â€“ the single or solitary weka, the weka found on his own. Weka were an important food source. Wekatahi was the site of the last main kainga lived in my Te Kawerau a Maki.